Metis Reach, Frequency, and Overlap reports help you take a deeper look into how your campaigns performed yesterday so you can make better decisions for tomorrow. Metis RFO reports give you better insights into your live campaigns. The frequency of impressions, the audience, and spending patterns are all available so you can pivot and steer your campaigns to success. Spreading your message means reaching the largest number of potential customers, as frequently as you need to, without annoying them or turning them off. You organize the campaign and set things in motion. Then wait for feedback. Getting that feedback in a single, easy-to-scan report isn’t so common. But Metis isn’t just another common solution. Marketers working with large scale advertising campaigns need new ways to derive insights for their live efforts. What is the user’s buying behavior? How effective is the creative? What effect do the campaigns have on each other – does one campaign either boost or cannibalize conversion rates? How efficient are the media buys? These are complex problems that require accurate data. Until recently, no vendor had the tools to process the data quickly. 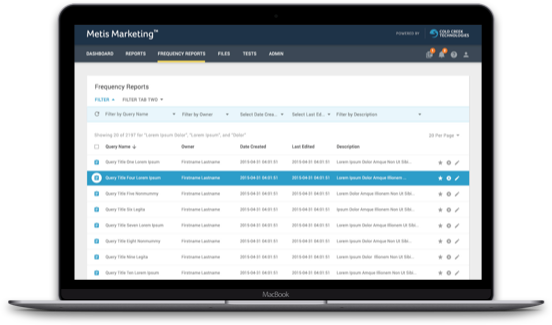 Metis RFO (Reach, Frequency, and Overlap) reports help marketing professionals like you make sense of media campaign data. Our reports provide frequency, reach, and overlap data across individual campaigns as well as down to the site and creative level. How do we do this? We analyze data from your preferred digital advertising sources at the log file level using a custom data management technology. Our proprietary methodology enables us to process your data at more than 1000X the speeds of equivalent platforms. Unlike other platforms, we use complete data – we do not sample. No estimations or high-level visualizations. Data processing that requires days or weeks at other providers takes us mere hours. Data granularity and speed set Metis Reach, Frequency, and Overlap reports above other solutions. Metis Reach, Frequency, and Overlap report not only provides the traditional tools you need to help control ROI and save wasted impressions but also enables you to gain deeper comparative insight of user activity across your campaigns. Other platforms may give you estimations or high-level visualizations. With Metis, you get the most complete, granular data available. We do not sample. You get correctly processed data for every transaction. But what’s the real effect on reporting? 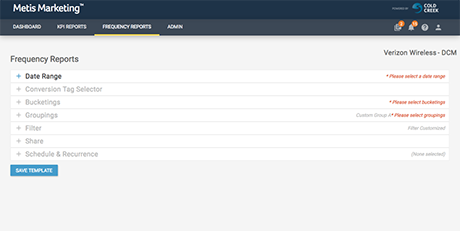 Frequency reports show impression frequency for customizable user populations across individual campaigns or sites. See populations by type of engagement – impression, click, or conversion. Averaged Frequency information by both site and campaign is broken out, enabling you to see which sites are both high and low frequency. Reach and Overlap help you find unique users duplicated between sites or campaigns. It also identifies exclusive, unique users for particular sites or campaigns that aren’t found anywhere else. Reach and Overlap reports can help you find opportunities by comparing user populations across campaigns, and understand which campaigns scale efficiently and which ones do not. You can’t get those results from sampled data. Only the most granular marketing data helps you make sound, evidence-based decisions about your campaigns. If your campaign is underperforming, you need to know right now so you can make changes. With Metis you can analyze the frequency, reach, and overlap against your KPIs, so you can pivot during live campaigns. Competitive solutions focus on audience overlap, overlooking accurate counts of wasted impressions delivered above contracted frequency caps. A deeper analysis of campaign overlap helps you to take advantage of market gaps, understand audience performance across campaigns and websites, and look beyond simplistic understandings of ROI while controlling spending. Get valuable insights from campaign-level, site-level, and creative-level reporting. Identify exclusive, unique users for a specific site or campaign not found anywhere else. You not only find out where your campaigns work best, but you also see where they can scale and do even better. RFO reports help you increase revenue from your existing and future campaigns. Overexposed ads get ignored, or worse, lead to unfavorable perceptions of your products. Assist your campaigns by identifying optimal impression frequency to cap spending, save on wasted impressions, and protect your image. Identify low impressions sites earl, and make adjustments to spend your media budget more efficiently. Metis Data Snapshotting helps you understand users as they, and their buying habits, change over time. UserTwo visits the manufacturer site directly and is tagged as “in-market,” and is then exposed to ten ads for a retargeting campaign for “in-market” buyers. Without data snapshotting, both users’ profiles and activities appear identical at the end of the campaigns. With data snapshotting, dynamic user profiles are used to track the effect of the ads, allowing you to differentiate which activity in your report is due to your brand advertising successfully driving user engagement, and which is due to an effective retargeting campaign. Tying together an evolving unique user and all their associated advertising data not only keeps your digital marketing strategy precise and on budget, but also opens new messaging opportunities. With our Data Visualization tool, you see real-time results of your campaigns. Add or remove metrics on the fly. Download and take graphs with you for easy sharing or presentations.